Where do wild turkeys sleep? 1. In trees. Turkeys spend their nights sleeping in trees mostly for protection from predators. The only exception is when female hens risk danger to stay with their eggs on the ground during the roughly 28 day incubation period. How far away can a turkey see movement? 4. 100 yards. Turkeys have excellent vision — maybe three or four times better than humans. Because their eyes are on the sides of their head, they have periscope vision and can see 360 degrees with the simple twist of their neck. 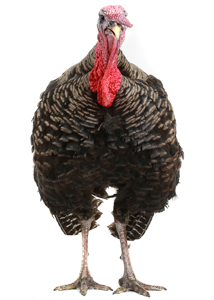 Which U.S. president was the first to offer an official pardon to a Thanksgiving turkey? 4. George H.W. Bush. While there were informal pardons and stories about turkeys spared by U.S. Presidents dating back to Abraham Lincoln, the White House records show the first official pardon was granted by George H.W. Bush in 1989. What is the specific name for a baby turkey? 2. Poult. Once a poult frees itself from the egg, it can start following its mother hen away from the nest within 12-24 hours. Approximately how many turkeys are consumed each year at Thanksgiving? 3. 46 million. According to the National Turkey Federation, Thanksgiving turkeys account for 18 percent of all turkeys raised on American farms this year. Now you are in the know about some of the unique habits of our popular holiday centerpiece. Enjoy your Thanksgiving!